PLEASE NOTE: Our certificate has been renewed on 22 April 2015. Please follow the below procedure again if you have completed the procedure before 22 April 2015. It is possible to accept online payments for your online entries. Players can pay their entry fee using their PayPal account or using a PayPal supported Credit Card. Players do not need a PayPal account to pay online using a Credit Card. You do need a PayPal account to accept payments. Please mind that you can only use this option when your PayPal account is known as Business or Premium customer. How do I setup Online Payment using PayPal? Visit PayPal.com to setup your account. You will need to have a Verified account to allow encrypted payments. If you are accepting lots of payments it is advised to raise your account limit. Please be aware this may take several days. To allow us to accept payments for your PayPal account in a secure way you need to setup the encrypted payment settings. 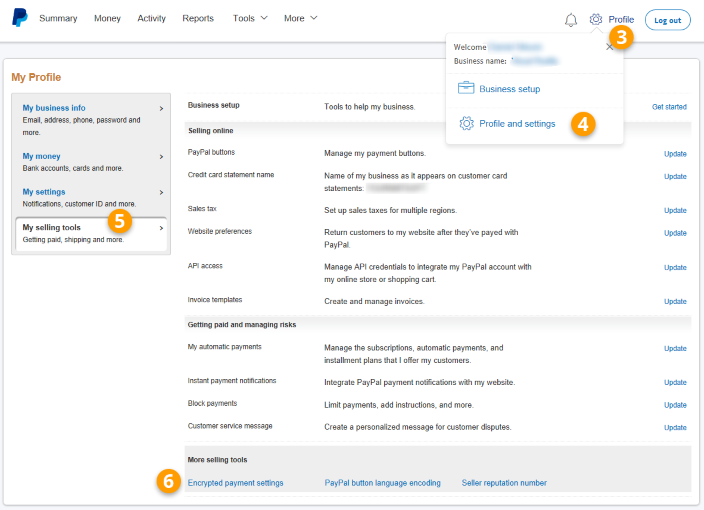 There are some additional steps you will need to take to set up Encrypted Website Payments with PayPal. To allow us to accept payments for your account, you need to add a certificate to your PayPal account. PayPal uses this certificate to identify our website (tournamentsoftware.com) if a payment is received for your account. Login at the PayPal website. Click the 'Profile and settings' submenu. Click on the 'My selling tools' section. Click on 'Encrypted Payment Settings'. Press the ‘Add’ button to add our Certificate. Our certificate is now displayed in a list, together with a Cert ID. It would be something like ‘RPGZVQWTKVMN4’. 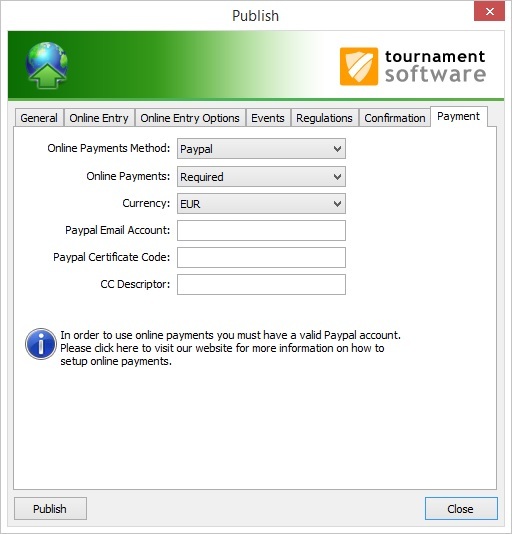 You need to specify this Cert ID (displayed in front of the certificate) in the Tournament Planner on the Online Payments Tab of the Publish Tournament window. Go to the Online Payments Tab of the Publish Tournament window. Fill-in your PayPal account and the Cert ID created in the step 2. - The entry fee comes directly into your PayPal account. - We are not a bank and do not accept money for your online entries, we only facilitate payments to your PayPal account. - PayPal charges you transaction costs for receiving payments. - We charge you a fee per tournament when accepting Online Payments for these tournaments. - We cannot access your PayPal account. So we cannot refund Online Entry fees if needed. You will need to do this yourself.